Sry, I do not have any photos yet, as the kit is on its way in transit, having ordered it only the other day off eBay. I am eager to start, so I wanted to create this thread anyway. Having recently seen some reviews of Bandai's recent release of their 'perfect grade' Millennium Falcon model in 1:72 scale, and then seeing the price, I was unable to convince myself that I would want to buy it, so.. I started buying stuff for this Polar Lights Enterprise Refit kit instead. Being a proficient scale kit modeler, and an aspiring airbrush user, I am glad to finally get to soon have a look at this kit, which I have wanted to buy for so long now. * I will consider adding a very light sheen of white aluminium or maybe chrome (I have to test this combo first) over the basic white color. All Vallejo acrylic colors. Tip: Vallejo metal colors can be heavily diluted with thinner and sprayed on perfectly with really thin coats. * Adding aftermarket photo etch (Paragrafix 111). * Making use of bit of styrene when useful. * Designing my own model stand, to be rigged for lighting, with a few buttons. * Lighting the model, with as many lights as I can. * Having the light setup have longevity, so the LED's don't die on me after some time. * Making use of water based paint for the special red, green, blue & gold coloring. * Making my own paint masks (should be easy). Using Tamiya masking tape, probably. 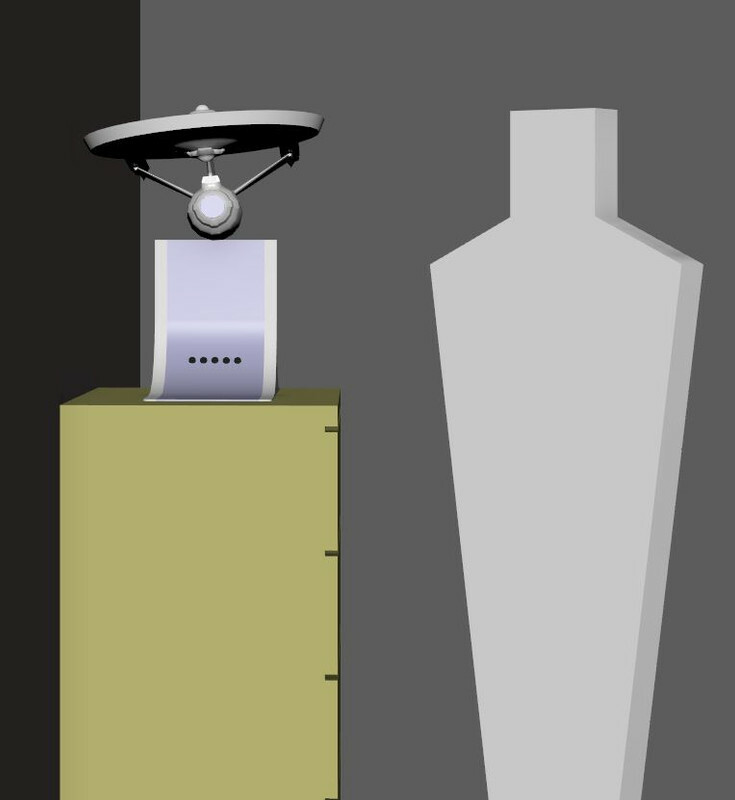 * Making use of "Trekmodeler's paint guide"
* The model will have to stand on display in the open in my living room, effectively collecting dust over time, as I don't have any plans for a cabinet for a model of this size. * Ending up having a nice, clean, crisp result. * Maybe keeping the hangar door closed. Unsure. * I will probably be using Vallejo acrylic paints, and Vallejo white putty, in addition to whatever water based paint I get for the four iridescent colors (red, green, blue & gold). Obviously, experimenting and testing with the coloring will be required, to get to have an idea how the painting work will end up looking. Wouldn't want to experiment with the finished model. Q1:The Paragrafix 111 photo etch fret, has impulse grills for two different clear parts. The manual show the clear part that comes with the kit, but also some "DLM" clear part (after market part?). I can see that the photo etch grills are differently sized, but which one has the correct proportions? Q2: Is painting the insides of the saucer black adequate for blocking light through the plastic from installed LED's, or should I instead use metallic paint, or metal foil instead of black paint? Q3: Can there be too many LED's inside a kit for a 9 or 12V lighting setup? Either drawing too much power, or creating too much light? Q4: Would perhaps the provided decals in the box be of inadequate quality? Plastic kits sometimes have inferior decals, and buying aftermarket decals adds to the cost. Q6: Mabye an idea to paint the insides of every window opening? Won't be visible with lights on, but will be with lights off. Q7: Maybe add some thickness to the photo etched parts, when used for window openings? Maybe not auhtentic, but maybe the studio model guys didn't go that far? Q8: If LED's have limited lifetime, regardless of why it failed over time, is there a way to know which types of LED's have better longevity than other LED types? Q9: What would the weight of a regular Refit model be without lighting installed, and what could a refit model weight with light rigging? I have an idea for a stand. There is an appeal for me to try design an interesting stand, to try avoid the generic model-on-a-pole-look. It would be very nice if there was a way to make use of magnets to have the entire model hover, just like with the Delorean Back To The Future model kit, which has that feature. 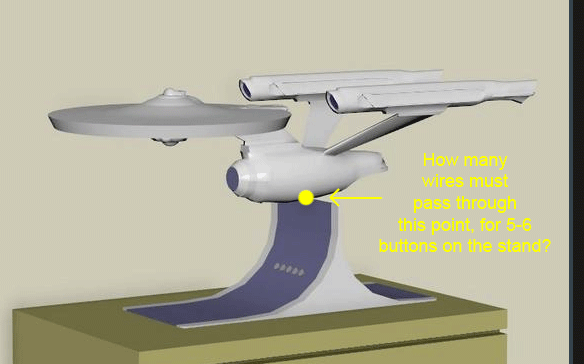 However, the magnets would probably have to be placed in the saucer and nacelles for stability, and then, the distance to the bottom would be too great I think. Maybe the magnets could be placed at the bottom part of the model, but then the model would probably become inherently unstable. Or, maybe not, or, the model would be too heavy for the magnets to handle the weight, or not. An alternative to using a stand, would be to hang the model, from strings, which would be nice. Maybe a stand + strings idea would work too, but I imagine it might look a little weird. In order for such a setup to work, the balancing point would have to be moved backwards, which might be a challenge.
! What I have learned from a 1:48 scale seaplane project, where I made the mistake of adding weights in the floater parts of the model, is that adding weight makes the handling of a model become weird, and potentially adding instability. Adding weight also makes fragile and critical structures prone to breaking. As for the shape of the stand, I sort of like the model appearing to balance off the edge, and the whole thing looks like a wave of sorts. The thin top edge would make it seem less bulky. It would be necessary to have this type of stand allow for installing 2-3-4 buttons for any lighting setup inside the model. Edit: Hm, instead of relying on a thicker circular metal rod, maybe a more flat metal part could be used to try conceal the connection between the stand and the model, which could make it seem the model balances perfectly right on the top of the edge of the stand. I wonder what a piece of tungsten strip would cost, and where to get it. Size 5 x 2.5 x 150 mm (or something like that). Or maybe a steel alloy would be sufficiently strong to hold the model upright. So, I initially thought I would want to see the model base being colored black, but, given how the stand design I am toying with sort of look like clothing, I wonder if it could look great with coloring the stand, with a color of either of the uniforms seen in the The Motion Picture, with some gold/silver officer stripe or some such (I have to go check this, and see how that would translate to the stand). Q1: The Paragrafix 111 photo etch fret, has impulse grills for two different clear parts. The manual show the clear part that comes with the kit, but also some "DLM" clear part (after market part?). I can see that the photo etch grills are differently sized, but which one has the correct proportions? NOTE: be aware that Don intends to end his long-time business by the end of this year. There are many ways to go about light blocking. Many people lay down coats of inexpensive black paint (for light blocking) followed by coats of inexpensive white paint (for light reflecting). Other people use foil. And then for little spots that need additional coverage, Tulip Dimensional Fabric Paint (in black) is popularly used. This can be purchased at the large chain hobby stores (Michael's, Hobby Lobby, etc.) to take advantage of those stores' 40% to 50% off single-item coupons. A 9-volt or 12-volt setup of 2-amps or more should provide more than enough power to the model. However, be aware that higher voltage lights usually means they are brighter, and then the issue of the lights being out of scale comes into play. As an alternative, there are 5-volt LED strips out there, and the LEDs and SMDs that are rated for 9-volt and 12-volt power will also work with 5-volts. This can help keep the overall lighting effects more in scale. Regarding the decals, the need for aftermarket sets depends on which 1:350 Enterprise refit kit you have. If you have the original Polar Lights 2005 release (kit number PL4204), then you have a basic set of decals that does not include an aztec set. If you have the first Round 2 2009 re-release (kit number POL808), then you have the basic set of decals and a complete aztec set. If you have the current Round 2 2017 re-release (kit number POL949), then you have the basic set of decals only. Round 2 decided to remove the previously-included aztec set in order to sell it separately (product number MKA001). Usually, the Round 2 basic and aztec sets are all most people use. 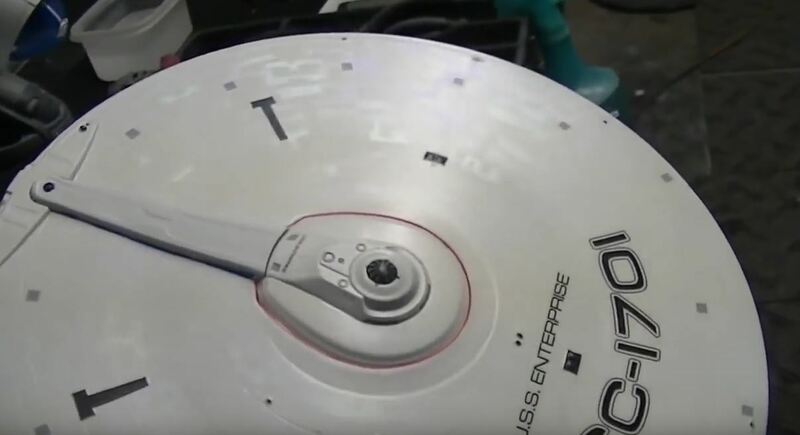 Sadly, there was not a lot of photographic documentation made of the Enterprise refit filming miniature during its use in the late-1970s and early-1980s. However, when Paramount offered the miniature up for sale back in 2006, many detailed pictures of the filming miniature were taken. NOTE: the pictures in that link are of the miniature in its -A paint scheme from when it was last filmed for The Undiscovered Country. That paint job is very different than the one used for The Motion Picture. I have a small set of reference photos from the time of The Motion Picture production. You can view them here: https://1drv.ms/f/s!Ar3rabUfjjIrhn0YzfnJCDo2DmN9. That may be an interesting look. I haven't heard of anyone doing that yet. The photoetch parts are usually more than adequate for adding additional detailing for most people. Of course, you can always go the extra mile and super-detail the kit with additional structural support pieces and / or greebles. All makers of LEDs provide retailers with various specifications for their products including estimate life spans. You can always check with whoever you might purchase those LEDs from for that type of information. I don't know of modeler who has actually weighed that model both before and after lighting effects kit installations. I hadn't seen some of these before. Great stuff! Thanks for sharing! Thank you for your input Gadgetron_3000! 1) The classical Star Wars models made for the first trilogy is obviously taking advantage of geometrical shapes, and for newer computer games I am sad to see that ship designs seem to be these generic looking objects having very little charm. 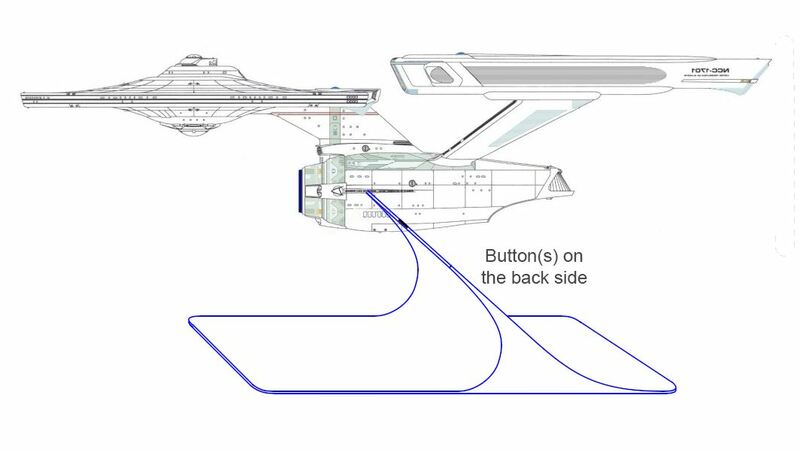 2) I think the work that went into designing the Enterprise Refit model seem to have made use of interesting geometry to create such a charming model. * The horizontal saucer shape is not only very distinct, but also contrasting nicely with the vertical center main pylon that connects the saucer to the eh deflector dish part of the ship. * There is a sense of tension in the saucer section, with the top and bottom center "pulled" up and down, and the specific detailing for the top and bottom makes for a very compelling design, as if it all made good sense this way, in no way being formalistic, as if using generic shapes as mere gimmicks. The design is in the details, and by making good sense of detailing, one ends up with what looks like 'design' as such. 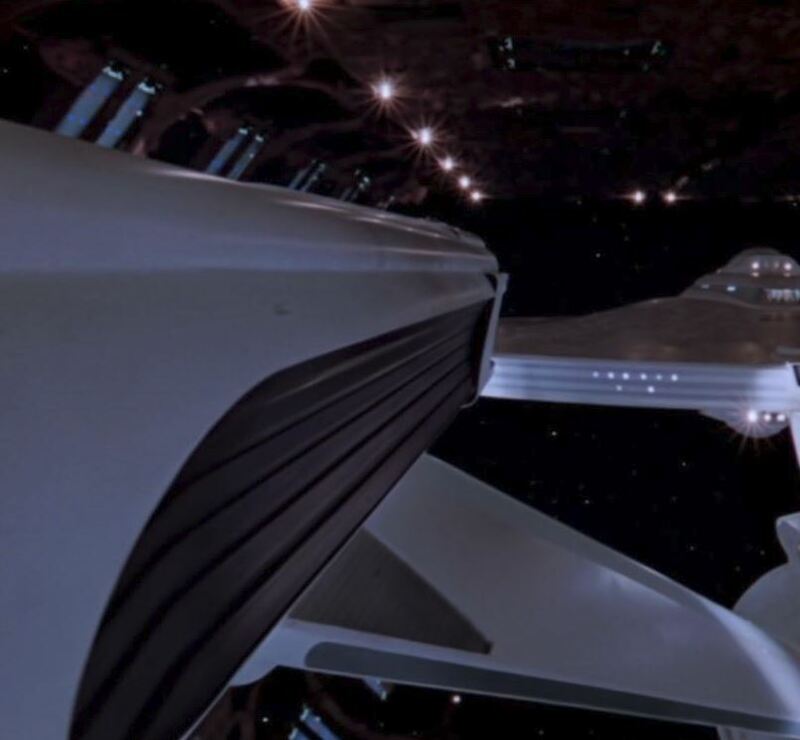 * The choice of colors, with white and black, seem to complement each other, being overall white, with specks of black for contrast, and then, additional colors has been added to make each part of the ship seem unique, making it look like 'design' as such. * There is with the overall shape, a sense of something being weightless, as if the ship simply hangs in space, which is fitting in outer space, which has no inherent direction or alignment, or gravity, for a ship like object to try react with, and not even to pretend as such, other than going forward. * The cylinder like structure of the main body, is akin to how fighter jets were designed in the "cold war" era, to get to achieve maximum speed, going past Mach 1, with a bulging shape reducing the drag at those speeds for jets in real life. The bulding saucer also mimic this general of producing less drag in a fighter jet like object for higher speeds. * There are angles around the ship body, which also lends itself to an object at speed, with diagonal surfaces around the side of the saucer, and the rear end of the two long nacelles. The curved excavation below the hangar opening, also seem fitting for an object at speed. * The entire ship seem designed to allude to being a speedy thing imo. * The choice of changing coloring, with red color for impulse speed, and blue for warp, offer a helpful clue, and gives the ship an identity in how it functions. * My impression of the Enterprise refit in the movie Star Trek The Motion Picture, is that the hull is something hard and solid, with the very flush surface effect, sea shell like, and sort of washed smooth by water, and having this metallic sheen in addition to the glossy surface effect, and it helps with the ship being mostly white'ish. * A silly thing with older sci-fi props, seem to be an overall lack of design, as if an attitude towards a given formalism was the only hint at design choice, which is half assed, compared to what was seen later with the Star Wars asset design. 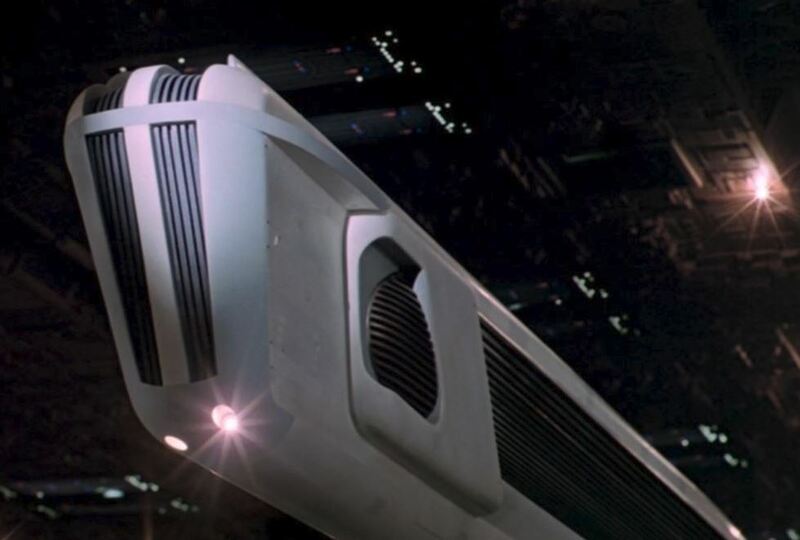 I think a modern spaceship today, has to be made like the fun movies are made, a layered approach to things. If it isn't that one thing you like at any moment, you also fancy looking at something else the next moment. A more compelling viewing experience, and also creating this overwhelming mysterious charms that most people are only happy to enjoy without analysing it to death, like when analyzing movie in every which way. 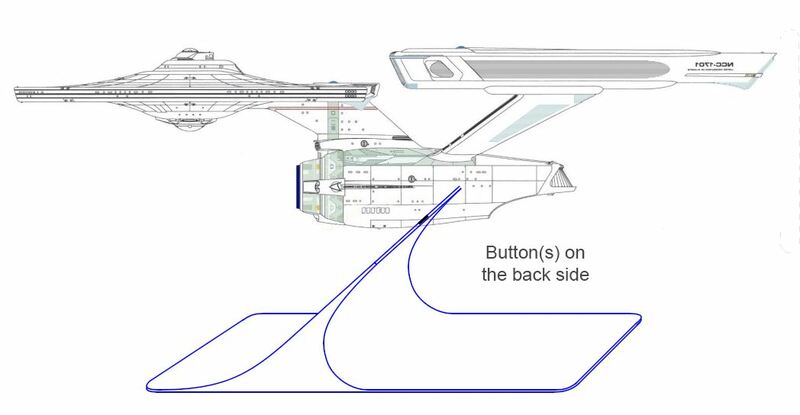 * There is probably more things to be said about the design of the Enterprise Refit model, but I'll stop right here. * The two nacelle pylons look like bird arms I think, but yet they look so solid, and the long nacelle shape is contrasting the pylon, abruptly ending the directionality of the "bird wing like" pylons, avoiding a blatant shape that could be attributed to a choice of formalism. A simple allusion to something else, without overstating it. Oh, I should stop here. In part 1 of the video I linked at the top here, Andrew Probert explains that the amber color of the deflector dish is amber because the deflector dish is working in a low power mode, for impluse speed, and going blue, when the ship is a warp (more powerful when blue). Hm, I guess the stand could work as wel, flipped 180 deg around. It is difficult to know exactly what the reflections would look like, if the stand was reflective, but I can at least imagine that the glow off the deflector dish will easily be visible in the reflection image on a glossy stand. The bottom most light on the ship will be surely be reflected off the stand this way. A benefit of giving the "wave" a bend, is that I can now have more easily add some buttons on the rear side of the "wave" surface. , hiding the wiring inside the center part, with the power chord sticking out on the side. A downside of having the edge of the "wave" butting against the model, is that, this only looks ok when the top edge is at eye height, or lower. If being higher, as if the model was placed above your eye level, the stand itself will sort of block the view of the model, when seen from the side. I bought this 15 x 2 mm flat profile aluminium stick, which I will try to use, and I will want to place a 20 cm long alu stick shaped with a bend, being flat for the horizontal part in one end, and being straight 45 deg on the other end (goes into the model). The wiring will have to be hidden on each side of the alu stick, hopefully the wiring can be hidden. I may want to excavate and make a curved "dent" at the top of the "wave" stand, to make the model sit a little bit into the edge of the top of the stand, to better hide the two power wires that will be required to power any lighting setup on the model. Presumably, it will be a good idea to have room for some excess loose wire on the inside of the stand, so that I can actually remove the model off the stand without the wiring snapping. As for coloring the stand, I am conflicted. 1) I think I would like an all blue stand, that goes against the white model. 2) However, an all blue stand will be just blue. I could try add some white to the stand, so as to allude to the parade uniforms, which were a combo of white around the top and torso and blue on the sides and bottom. 3) I think it will be interesting, to maybe achieve a good reflective sheen on the stand, however what color to use? Ideally, black would be best, or even a pure mirror surface, but a true mirror effect would look boring imo. But with black I can't get to color the stand blue. If I color the stand with reflecive blue, I worry that the image in the reflection won't look as nice on a blue background (or maybe it will). 4) An alternative to blue, could be white (white = command), but with a mostly all white model, a white stand might look boring. 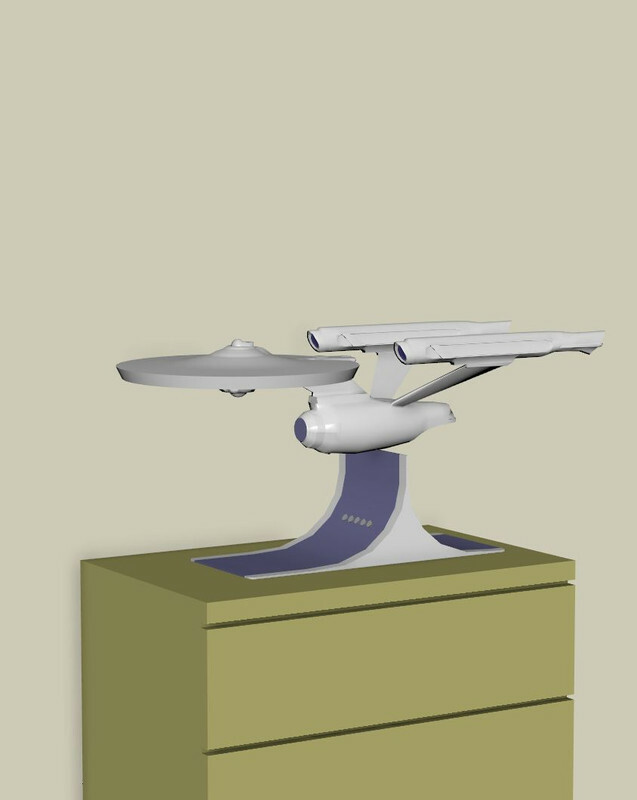 I knew better than making a 3D model of the Enterprise myself (it would be fairly easy, but I don't want to), so I downloaded a free model off the internet. Better than nothing, and better than me spending time compulsively recreating the exact shape of the ship. The drawers depicted here is ah 120 cm tall, 80 cm wide, 50 cm deep, with a 180 cm tall human figure next to it. The model is tilted a little upwards, and a little to the side, making the model look more lively this way I think. The shape of the stand sort of makes it non ciruclar, so it won't just plop down on a table as gracefully as a circular stand, unless you aren't bothered with the angular stand possibly being skewed every which way on a surface. Rounding the base of the stand might make the stand seem more fitting, if placed on a rectangular surface. Ofc, one way to counter the angled shape of the stand, would be to get a round table. Or.. add a circular patch to the stand. The length of the stand would make it look odd, on surfaces that is smaller. In the image above, the stand was made about 60 cm long iirc. Probably a good idea to keep the length to under the common depth of drawers and the like, being 30-50 cm at most. 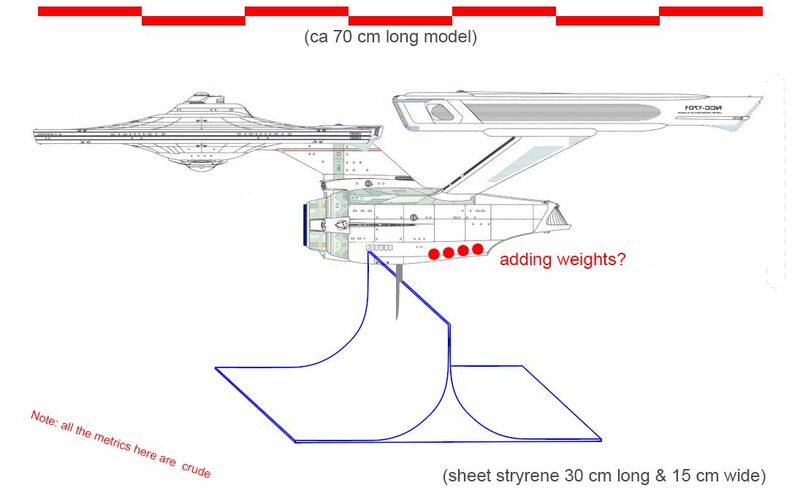 If the model is place above eye height, then you won't see the top of the ship, unless you somehow get to rotate the model to the side a little. Probably a good idea to have a somewhat heavy metal plate at the bottom but I don't seemyself making that to be honest. 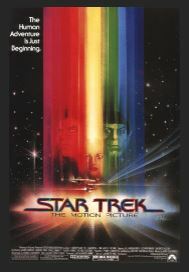 Edit: Idea: One could have a black colored stand, with some kind of colorful Star Trek stripes going from top to bottom. Edit: The color of the stand on the side, is supposed to be black. I forgot to color the side properly. Edit: I guess, why settle with just one stand! Make two different ones, with different height! 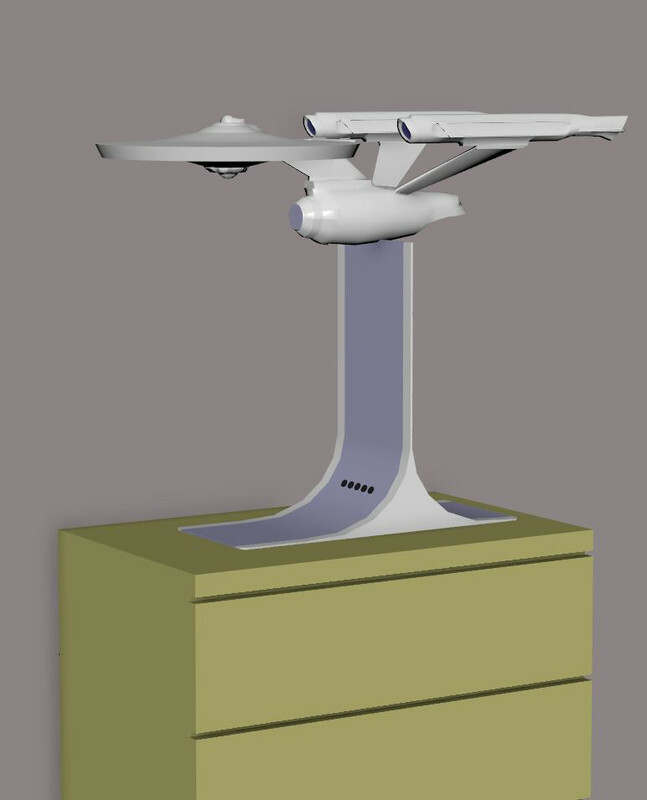 Here is the other stand, but flipped around: Rotating the model on this stand, would make the nacelle pylons become misaligned with the front angle of the stand, which just so happened to sort of match the angle of the nacelle pylons here. Another idea: Imagine having a transparent sheet of thicker acrylic, and have the model be fixed into that, with the big flat acrylic part standing vertical, meeting the colored base further down. No idea how to encase/entrap the model inside such an acrylic sheet perfectly. I was thinking it could be interesting maybe, to have a separate on/off button for the aboretum. Also, the logo on the side of the ship is lit, either directly, or perhaps just being a lighting trick by shining light through the plastic. Unsure if I've seen this particular area having been lit by lighting before. Hmm, I wonder what the temperature might be inside a fully close and lit Enterprise model. I guess, the LED's aren't that hot, or I could imagine the LED's fail by becoming too hot over time. With up to five or maybe six button on the stand, I expected at first to just run two wires up to the top of the stand, to feed into a hole going into the model to power everything, but I am now unsure that two wires will be enough. As I imagined it, there would only be room for two wires at the "joint" location where the model rests on the stand. Hmm, I now think there could be two pairs of four wires, but maybe even that won't be enough, for the 5-6 buttons on the stand to work. Heh, having never before rigged a model for lighting effects, only now does it dawn on me that there has to be numerous wires going through the point where the model rests on the stand. I sort of imagined there could be only two wires, but with 5-6 buttons on the stand, I guess there must be at least 12-14 wires in total. I have six buttons, and seven wires running up through the mounting tube. Of course, the base is stuffed full of wiring, and so is the model! I used Orbital Drydock's eight wire plug. Good luck! I am considering the Mega package by Tenacontrols, which afaik has five buttons included, unknown how they are used. If I want a button for the aboretum as well, that would make it six in total. Hm, if I only need one wire for each button, then with one power wire and one grounding wire, I could maybe have only eight wires the way I imagine it. Would I be correct in thinking this? Thinking out loud: With my 2 x 15mm profile alu stick, I could maybe run four wires on each side, because of how the alu stick is 2mm wide, and then using 2x2 mm on each side, I could have 2x2 wires going through there, beside the alu stick. Suggest you contact Ralph at Tenacontrols directly. He is very responsive to customer inquiries, and knows all you need to know about how to wire his products. My memory of the TMP Enterprise is that it was a nicely white colored ship. I think an important aspect to how a model looks like, is how it catches light. For example, "silver" painted airplanes looks great in the sunlight, and becomes lively, and it would be nice if this white colored model subject would look equally nice when lit by sunlight (obviously not looking like "silver, but reflecting/diffusing light nonetheless with its satin finish"). Hm, there is something peculiar with the grills as seen in this still from the movie The Motion Picture. 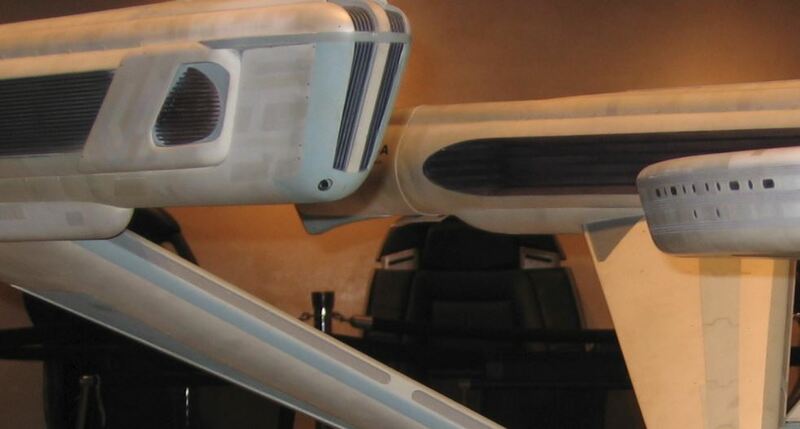 Not only is the inner nacelle grill obviously curved on the front end, the shape of the grills seem pointy. Maybe the light inside shine though a thinner slit, filling the edges of the V shape with light. I will have to meditate on this so to speak. Edit: Heh, I realize now that what I am looking at here are flat surfaces, and not the bulging shapes I thought. Maybe it is some kind of specular variation in the coloring that makes my brain think the shapes are bulging outwards.